For detailed instructions visit headtrackr.com or headtrackr.de! 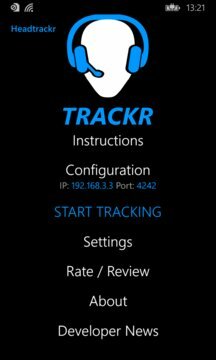 Your phone’s compass and gyroscope measure your head movements (yaw, pitch, roll) in real time and transfer these movements via WiFi to the application opentrack on your PC. 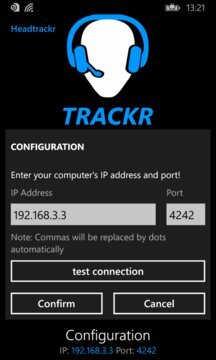 opentrack then sends these movements via the freetrack protocol to the game you are playing on the same PC. Very accurate with no delay! Head tracking will still work using just the compass and the accelerometer, however the experience will be less than optimal. Looking up and down can result in also moving your view a little bit left and right. At the same time the view is not stable. I would suggest to set "Roll" to "Disable" in the "Output remap" settings of opentrack. As long as you use this for only looking around in game, everything should be fine. However it lacks the accuracy to use it for aiming.